Preheat oven to 350° F. Unroll crescents and separate triangles. Stretch dough so the triangle is even and symmetrical. Cut a piece of prosciutto to fit the center of the dough triangle, stopping an inch before the point. Add 1 tbsp of drained fire-roasted tomatoes across the wide edge at the top, then sprinkle 1 tbsp of grated cheese over the tomatoes. Spread 1 tsp of humus over the cheese. Starting at the wide edge, stretch dough over stuffings, and roll crescent to the point. Brush top of roll with olive oil and place an additional Tbsp of grated cheese on top. Repeat with the rest of the crescent dough triangles. 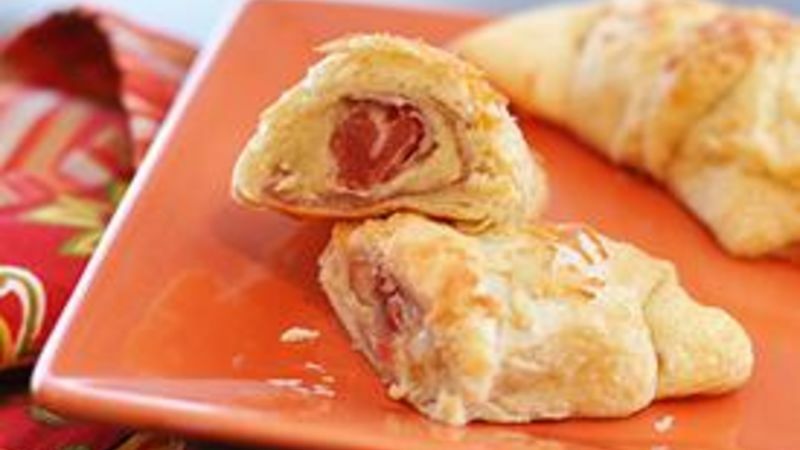 Place crescents on ungreased baking sheet and bake 12-15 minutes, or until golden brown and dough is baked through. Remove from tray to cooling rack. Serve immediately. These sandwiches pair well with Progresso Creamy Tomato Basil soup, crisp salad or chilled melon slices. I love prosciutto and crave the combo of tomato and cheese in caprese. So I did one magnifico mash-up in this hyper hybrid sammy, all snuggled into a Big & Flaky Crescent. As for salty stuff, Italian flaves are just the bomb diggity. And these little grenades pack a big blast of taste --perfect for dabbing into a bowl of Creamy Tomato Basil soup (try Progresso's!) or hookin' up with crunchy salad or chilled melon. Cut a piece of paper-thin prosciutto to fit the dough triangle. Add a Tablespoon of drained Muir Glen organic fire-roasted diced tomatoes. See, when you use the fire roasted ones, you don't need to add herbs cuz the flavor's already in there! Then a tablespoon or so of grated cheese -- I use a 3-cheese blend of Italian awesomeness like Romano, Asiago and Parmesan, but you can pick whatever kind makes your eyeballs roll to the back of your head. Then a little secret -- add a teaspoon of hummus. This adds a touch of Mediterranean flavor and a bit of creamy texture. If ya don't like hummus, well then, juuuust skip it. Roll 'em up! Stretch the dough over the top, then roll gently to keep the stuffings inside. Then brush with olive oil. And top 'er off with a tablespoon of grated cheese to create a crusty cap when they're baked. Now do the other 7 triangles and put 'em all on an ungreased baking sheet. Bake at 350 degrees for 12 to 15 minutes or so, until the rolls are golden brown and baked through. Look how they puff up! Geometry magic. Serve with soup, salad or fruit while singing an Italian aria!